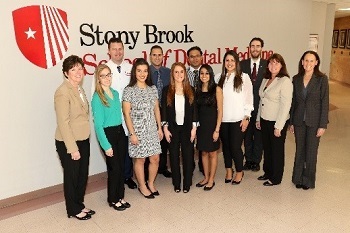 November 2017 - Seven Year 1 Stony Brook School of Dental Medicine (SDM) students were selected as recipients of merit-based scholarships: Elana Kurlander, Gina Dolisi, Upasna Malhotra, Alexander McGuiness, Sarthak Nayyar, Noelle Fischer, and Stefanny Vieira. During the luncheon reception hosted within SDM, scholarship recipients were greeted by Dr. Mary Truhlar, Dean of SDM, as well as by the representatives of the scholarship donors. The reception allowed the scholarship recipients an opportunity to meet with their respective scholarship donors, and to participate in discussions regarding their educational and career trajectories. Students expressed their messages of thanks, and reflected upon the positive impact of becoming scholarship recipients. The J. Howard Oaks Scholarship was presented to Elana Kurlander, The Dental Medicine Scholarship was awarded to Gina Dolisi, the Thomas and Nicolina Nasti Scholarship in Dental Medicine was awarded to Upasna Malhotra and Alexander McGuiness, the Dimitrios Kilimitzoglous Scholarship was awarded to Sarthak Nayyar, The Robert Renner Scholarship was awarded to Noelle Fischer, and the Fred S. Ferguson Scholarship was awarded to Stefanny Viera. SDM congratulates the scholarship recipients on their recognition.